With close to 69 million people, Thailand is the world’s 20th most populous country. Additionally, it is in the top ten of the most visited destinations by international tourist arrivals. Interestingly enough, tourists may stumble across a quite flourishing cannabis industry — despite the fact that cannabis and other drugs are officially not tolerated. However, a recent cabinet resolution pushed for the legalization and research of medical marijuana in Thailand. Cannabis for recreational use is illegal in both Thailand and Cambodia. 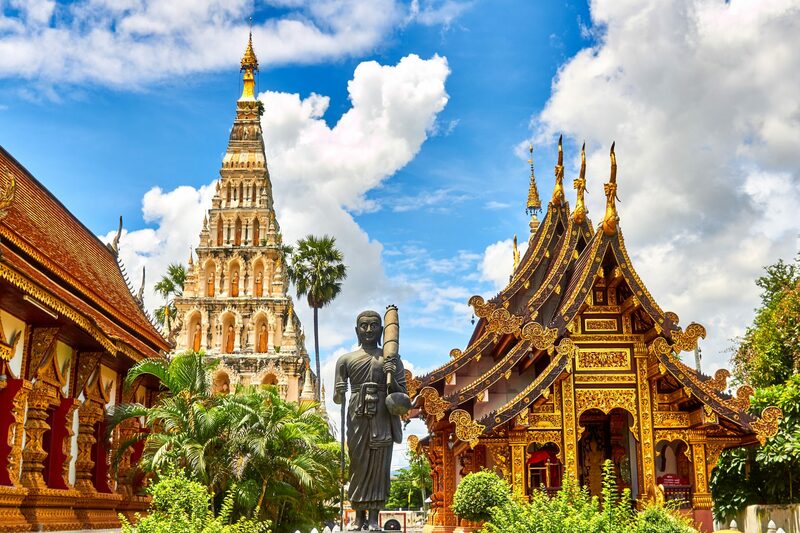 Thailand recently legalized medical use of cannabis. Marijuana is deeply rooted in Thailand’s and Cambodia’s history. According to several reports, cannabis can be found openly sold in bars and restaurants. Imprisonment not exceeding 1 year and a fine of $3,000 to $30,000 for consumption. Imprisonment not exceeding 5 years and or a fine not exceeding $3,000 for possession. 2-15 years of imprisonment and a fine of $6,000 to $45,000 for production, importation or exportation. Since the approval of the Cannabis Act in 1935, the possession, sale and use of cannabis is criminalized. Cultivation, transport and possession of up to ten kilograms of cannabis is punishable by a maximum sentence of five years in prison and/or a fine. If it is more than ten kilogram, the government may impose a sentence of up to fifteen years in prison and/or a hefty fine. However, for the majority of people the possession of a small amount of cannabis results in a fine rather than a prison sentence, since methamphetamines are viewed as a more serious issue by the domestic narcotics police. In fact, marijuana is openly sold in restaurants and bars in certain parts of the country. Moreover, some of these places are known by tourists as cannabis attractions, which results in cannabis being commonly found in tourist-heavy areas. Shops openly sell “happy” goods which contain cannabis. Furthermore, cannabis dealers do sometimes work with police officers who shakedown customers and demand a bribe. Despite the generally cannabis-friendly attitude, some tourists still end up in jail. Although rigorous steps have been taken by the government, there are still numerous cannabis plantations within the northeastern provinces of the Kingdom of Thailand, like Nakhon Phanom, Mukdahan and Sakhon. Additionally, without any human influence, wild cannabis is growing within the Thai forests, and therefore the cannabis plant has adapted to the local weather conditions. As a consequence there are special marijuana strains with their own genetics. The world-famous “Thai” strain is known for its high THC content and its sativa-typical effects. All of these points played a role in the legalization of medical marijuana in Thailand, but another very important point that shouldn’t be left out is the ever growing global cannabis market. Thailand and Vietnam are both popular with tourists and travelers are increasingly going to Cambodia on their trips to Southeast Asia. Apart from the beautiful nature and the old temples, there is also a relaxed attitude surrounding cannabis that is friendly to tourists. Officially, cannabis is illegal in Cambodia, yet the police tolerates the sale and consumption according to a local journal. However, police in Southeast Asia is also known to selectively punish it, without any specific reasons. Just as in Thailand, cannabis is often sold openly in stores and its consumers enjoy remarkably low prices. Due to the flourishing cultivation, there is an abundance of cannabis. The cultivation methods are simple and less technologically advanced. Thus the quality can vary, with the best buds being exported. However, THC containing cannabis can be found everywhere and it is often used in cooking recipes. Any place that offers “Happy Pizza” will serve a cannabis-made pizza that will result in a strong edible high. A recent cabinet resolution by the Thai government also authorized the Public Health Ministry, as well as the committee working on the extraction of THC and cannabinoids from the hemp plant for medical use, to control production, import, export and possession for research purposes. In preparation for the upcoming law changes that will give a green light for studies and tests of medical marijuana on humans, the GPO has plans to grow cannabis plants for further research and hybrid development. In an interview with the Bangkok Post, the GPO’s executive managing director Dr. Nopporn Ceanklin said, “We have come to learn that the cultivation of cannabis plants requires strict security and control protocol, not just in Thailand but in every other country because as a narcotic plant it can still be abused. Think morphine. Today it is used widely as a treatment for heart disease and for pain relief. Morphine, however, is extracted from opium, which in Thailand is categorized as a Class 1 illegal drug. Opium smoking today puts you in jail, but the medical use of it under prescription benefits humankind on a global scale. Marijuana should be treated likewise.” In fact, medical marijuana has been legalized in over fifteen countries across Europe and in many states in Canada and America as well. Dr. Nopporn is of the opinion that if Thailand does not move forward with the legalization of medical marijuana, the country might have to import cannabis extracts in the not-so-distant future.